www.photomacrography.net :: View topic - Diffraction-limited acrylic! Posted: Sun Sep 08, 2013 10:30 am Post subject: Diffraction-limited acrylic! hehe No not really, but amazingly close! 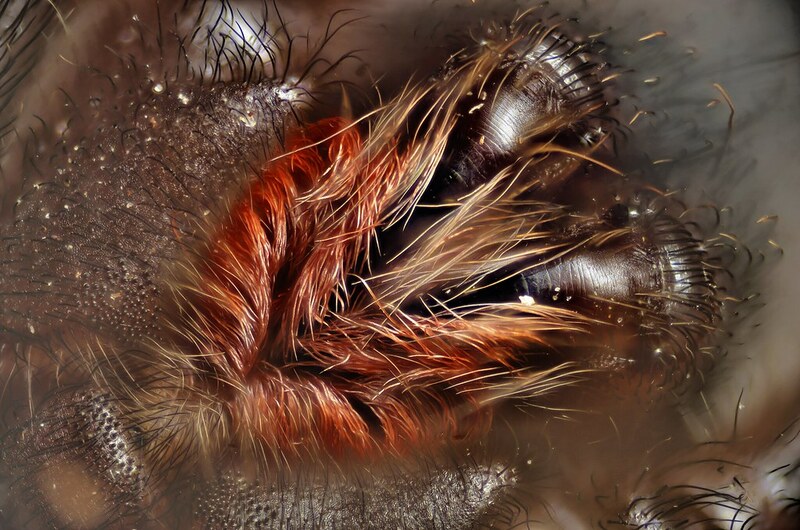 I took this stack last night of the fangs of a Monocentropus balfouri 1.5-inch sling (spiderling) which was sitting on the wall of its enclosure, and the texture on the full-res image was stunningly close to pixel level in IQ. Nice! What lens and f-number? What else but the CFI60 10x/0.25?! That little golden barrel has hardly come off of my camera since I began using it! This is interesting. I've not had much success shooting through thick media with NA 0.25 and above. That's consistent with theory that says spherical aberration should be a problem. But here it looks like you're shooting through maybe 5 mm of acrylic and the image looks good. Can you confirm the wall thickness? Did you have to do any unusual processing of the image, say to restore contrast? Just checked ... it mics at ~4.2mm thick. I certainly expected longitudinal CA as you did, but CaptureNX2 supposedly removes CA by default, not sure whether this is longitudinal, lateral or both -- or even how well it works. Contrast/sharpness were not changed during the CaptureNX2 operations. I also expected significant deviation from optically plane surfaces (even at this relatively small aperture) showing up primarily as axial astigmatism or random highlight flares. 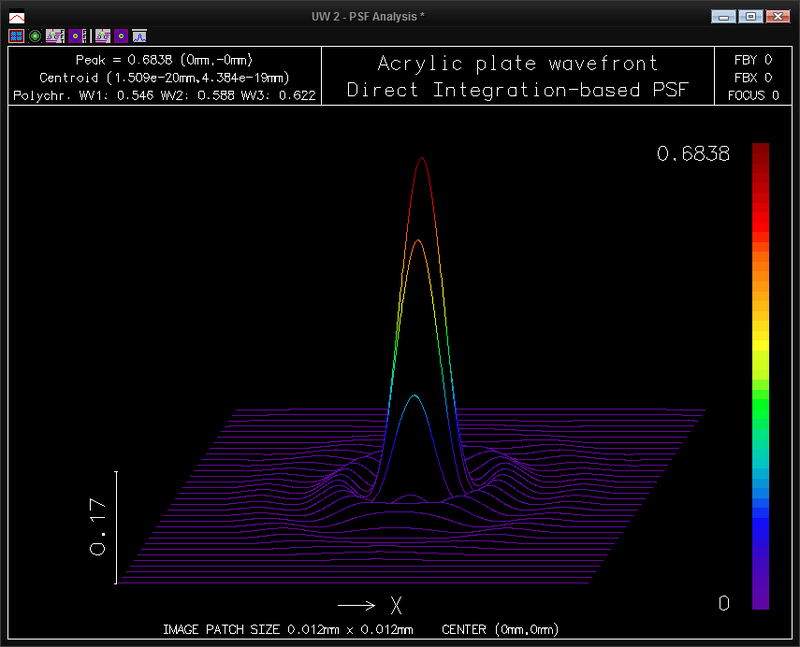 Also expected was contrast-reducing microripple (typically of much smaller periodicity than this aperture). Contrast appears to be pretty good even though the outside surface was rather dirty, made worse by being lit strongly by the flash. Trying to compensate for this last, I first took a shot of a spider (same enclosure, relatively close to the same area) to set the exposure and pressed the Flash Lock button. Next chased the spider away, placed a velvet background opposite the lens and isolated it from direct illumination from the flash as much as possible, and finally took a shot which I hope approximated the loss of contrast due to surface dirt and smears. This image -- of random, uneven levels of darkness as expected from having as much as possible isolated the surface haze -- was subtracted from the untouched NEFs converted to jpgs. Not exactly rigorous methodology but is hopefully a useful approximation. This first full-res crop shows a portion of a fang as it came out of the camera (RAW file converted to jpg, no additional adjustments). This second crop shows the surface haze subtracted from the first image, a good increase in contrast merely by doing the above adjustment. This last image, also 'haze subtracted' shows a crop from near the image corner. No further processing has been done. Significant color is obvious, but appears to be fairly well-constrained to OOF features. Overall this seems consistent with what I recall reading in one of the performance threads on the CFI60 10x/0.25 objective. Differences which remain between these last two images and the very first shot in the thread are indicative of the further post-processing done after tiff-conversion from NEF. I was looking primarily for loss of definition, of which there appears to be fairly little considering the material between lens and subject. What do the rest of you see with your much more experienced eyes? I was expecting spherical aberration, not longitudinal CA. Spherical aberration (SA) manifests as reduced contrast, particularly for moderately fine detail but not so much for the very finest detail. 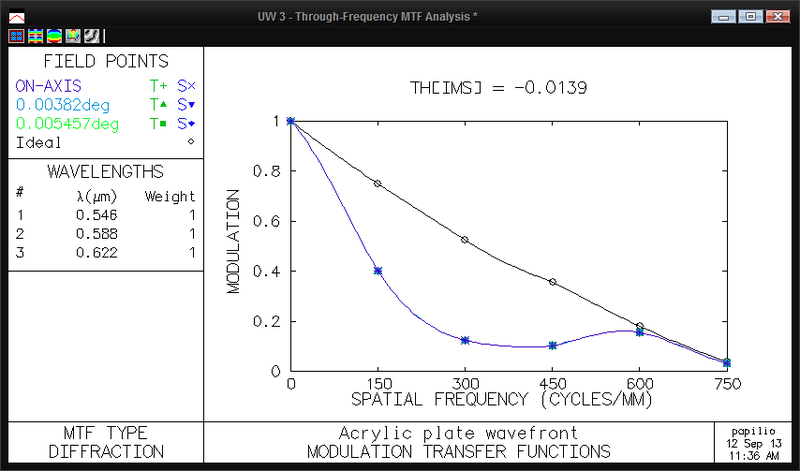 It causes a complicated and confusing situation where the MTF curve can drop clear to zero and even below at some frequencies, while remaining substantially unchanged near the unaberrated cutoff frequency. See http://www.photomacrography.net/forum/viewtopic.php?p=103915#103915 for an example of the overall visual effect, in that case caused by using an NA 0.55 infinite objective as if it were finite. In your case, I calculate a wavefront error of about 2.0 lambda, which I would expect to give a pretty bad image when compared to the unaberrated case. Pixel-peeping your crops, I think they're consistent with that. But at the same time, the overall image looks quite good. That's an important lesson for me. For shooting through thick media, stopping down is a powerful force in reducing SA. 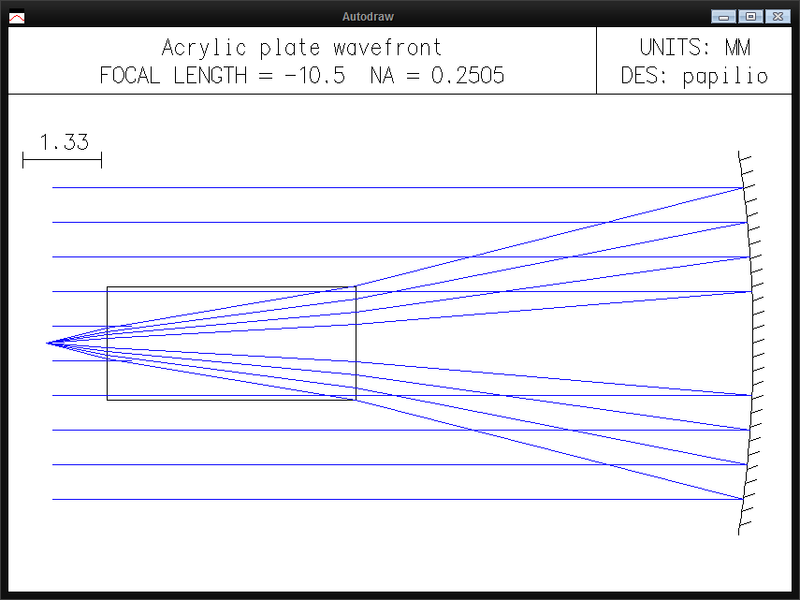 The wavefront error goes as the 4th power of NA, so halving the diameter of the exit pupil would give a 16X reduction and essentially eliminate SA as a problem in this case. 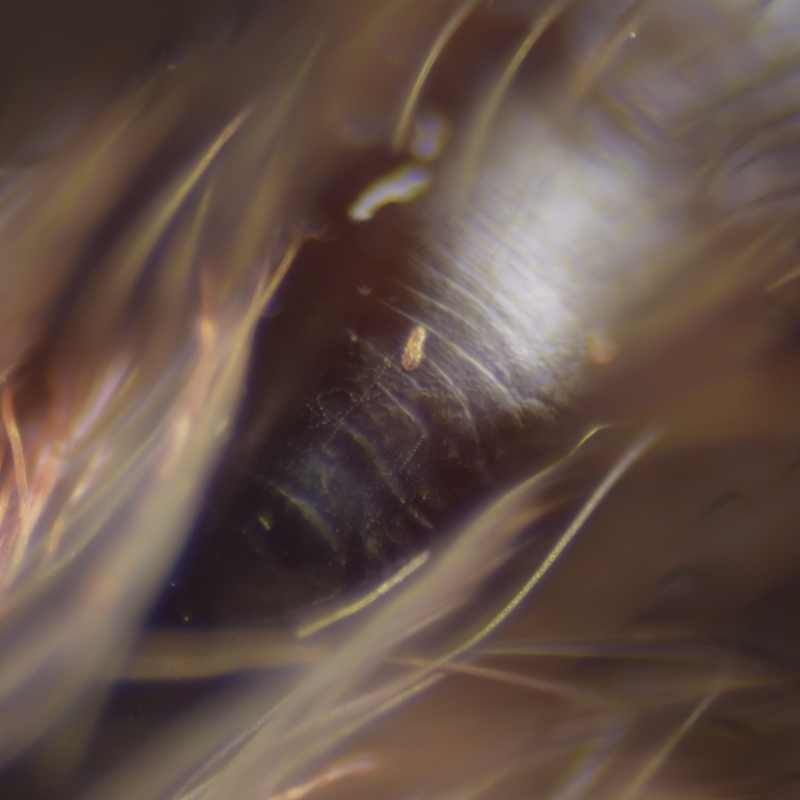 If you need to do a lot of this sort of thing, you might want to play around with sticking an aperture in back of that objective to reduce the diameter of its exit pupil by 1 or 2 f-stops. It's a tradeoff between improved contrast for intermediate detail and loss of ultimate resolution due to dropping of the diffraction cutoff. Thanks Rik .... first let me bang my head against the wall! I was in a rush to get to an appointment when I wrote the post, but yes, of course I meant to say that SA could be expected to be the dominant aberration. Sorry! So anyway, you come up with 2 waves lambda of error on the emergent beam (from the acrylic), yes? Wow, that's indeed quite some wavefront error, a lot more than I would have guessed by the resulting image! I do follow you on the MTF behavior at various levels of resolution -- I've found it interesting/amusing how the curve can apparently, under certain circumstances, swing to slightly 'better' than ideal contrast transfer at some (higher) frequencies. Secondarily it would be interesting (for me) to learn what this material does to the strehl ratio. I'm sure that's especially a mess! Certainly you noticed that, yes, the final image had its contrast significantly increased. 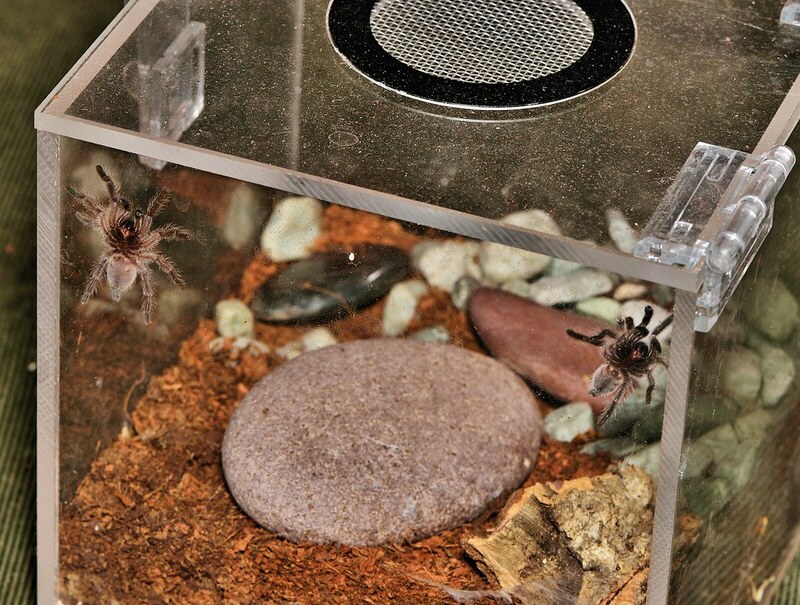 Before I got into macro, all of my spider photos were taken through the acrylic of their enclosures. Ultimately I became more confident of my ability to corral them again should they bolt and now virtually always take them out onto a studio set of sorts. Those early images were generally acceptable but my surprise came from seeing how much better this image was at ~5x! Just didn't expect that at all, and it will be a handy approach on those rare occasions when I need to keep a subject semi-tightly constrained in order to get the macro image which I'm after. My thanks to you Rik for the numbers, nice to have the material's effect quantified for me! So anyway, you come up with 2 waves lambda of error on the emergent beam (from the acrylic), yes? In gory detail... I model the lens system as a flat array of phase shifts that produces 0 wavelengths difference in total optical path length from subject to sensor, all across the aperture, in the absence of the acrylic. Then I introduce the acrylic and adjust the subject-to-lens distance so as to precisely refocus the subject through the center of the aperture. 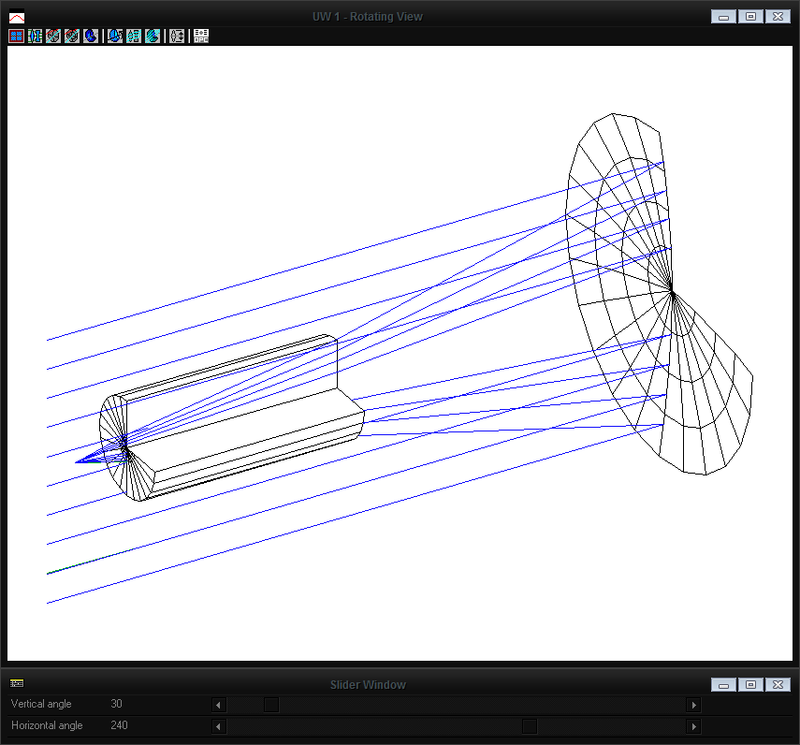 Recalculating the total optical path lengths then shows a difference of 2 wavelengths between center and edge of the aperture. I think that's equivalent to saying that the wavefront coming out of the acrylic deviates from spherical by two wavelengths across the aperture. Secondarily it would be interesting (for me) to learn what this material does to the strehl ratio. That would be interesting, but I don't have any tools handy to calculate it. Thanks for describing your process Rik, I appreciate it and your description is easy to follow. I'm not familiar with Zemax. For ray-tracing I use WinLens, but I don't know how to work this problem using WinLens. Of course I don't know internal details of the lenses we're using, so true ray tracing is impossible. If the ray-tracers have abstract components that would model a perfect lens, then I would expect them to give very similar results. My current tool is just an Excel spreadsheet that uses Pythagoras to compute path lengths based on simple coordinates and relies on Excel's "Solver" to find minimum length paths by adjusting those coordinates. This sort of first-principles calculation saves me from having to even wrestle with Snell's law -- all I need to know is that optical path length = geometric path length * index of refraction. Thank you Rik for taking the time to satisfy my curiosity! I kept having that gnawing feeling that the photos in the thread should not look as good as they do with 2 waves of error on the wavefront, that much aberration should be fatal by our standards. Recalculating the total optical path lengths then shows a difference of 2 wavelengths between center and edge of the aperture." Emphasis mine. This would imply that the approach which Rik used solved the focus of the paraxial ray, and that a tiny refocus solved so as to achieve the smallest RSM error across the wavefront should give a lower total P-V error. In other words, best focus is typically found to be a situation in which the edges of the aperture are level with the center (measured in this case at the lens' focus or at any point after the acrylic plate) when referenced against a perfect (spherical) wavefront. I need to make it clear that the methodologies used by Rik and myself were quite different. I, as Rik, had no info as to the design specs of the lens, and so I made some simple assumptions which I knew would be incorrect but which should still exhibit a relative discrepancy between the two focus solves. I used as the lens' focal length merely its working distance, an assumption which is most certainly wrong (the focal length is actually measured from a theoretical point somewhere within the lens), but which would none-the-less reveal a fairly accurate proportional difference in the wavefront errors arrived at by the two approaches. As the model for the theoretical perfect lens I just used a parabolic reflector, inherently fully corrected for both SA of the axial light cone as well as for all color errors . Just as eyepieces are raytraced in reverse, wavefront errors will have the same values when raytraced in either direction. So I worked this in reverse to Rik's approach, beginning with a perfect (spherical and converging) wavefront and solved so as to indicate the RMS wavefront error at any point after the light exits the acrylic plate. These are the system specs which I used. Light from infinity reflects from the objective's pupil as a perfectly spherical convergent wavefront, just as would be the emergent beam exiting the microscope objectives entrance pupil (light raytraced in reverse), considered for our purposes to be perfect. This light cone then encounters the acrylic plate (which had been ignored by light approaching the mirror). 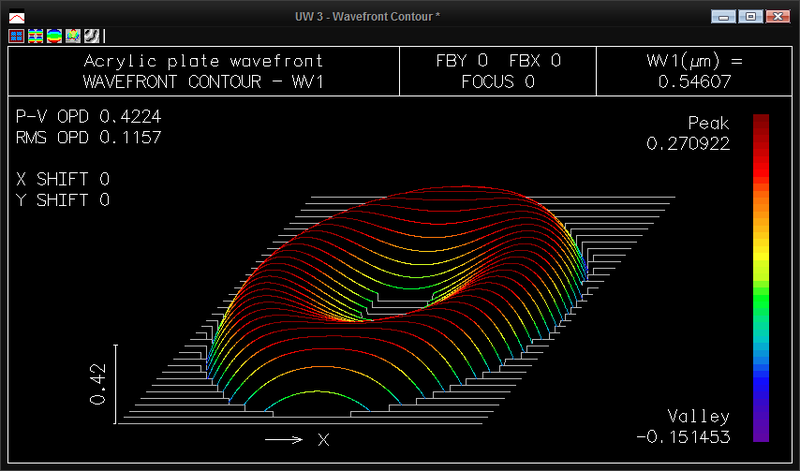 After exiting the plate, the rays will have an aberrated wavefront which will, depending on the focus point for which the system is solved, display either the wavefront of the paraxial focus (a simple curve profile to the wavefront) or the wavefront of a system solved instead for the lowest RMS value (a compound curve profile). 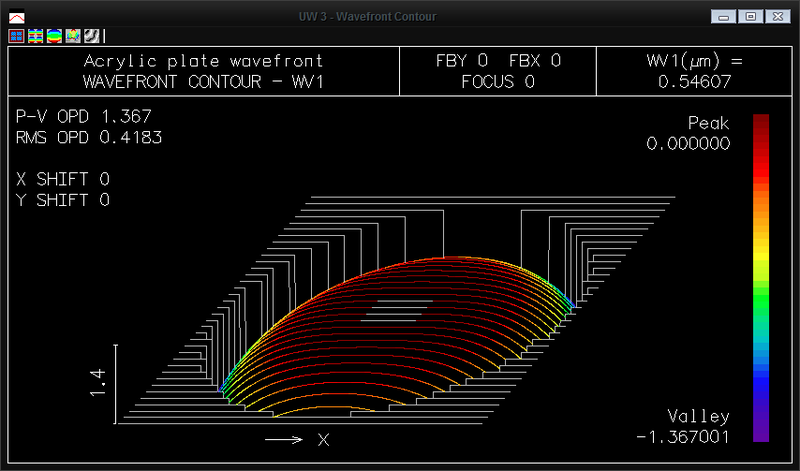 The relative wavefronts. (In the following illustrations Rik's solution in terms of my own will always be the first graph shown.) Since Rik's solution resulted in a P-V (peak to valley) OPD (optical path difference) of 2 waves, my own solve for the paraxial ray (1.367 waves P-V) is almost surely the consequence of the degree of error in my initial assumptions for the lens specs, and so the OPD value of the system solved for least RMS (0.4224 P-V OPD) needs also to be adjusted proportionally resulting in a value of 0.618 P-V OPD. The relatively high values of both are the result of SA introduced by the acrylic plate into the light path. The next two graphs indicate the profiles of the axial airy disks of our two solves. The central peak represents the signal, the rings surrounding this peak are noise. While even a perfect system also exhibits these surrounding rings, in the presence of aberrations light is stolen from the central disk and thrown into the rings, quickly reducing the system's S/N ratio. While a P-V OPD of 0.25 waves is generally considered to be diffraction-limited, or observationally perfect according to the Rayleigh criterion, a reduction of the OPD to 0.125 is still quite easily detected visually as an improvement in IQ. Finally we have the MTF graphs for the two solves, with which many of us are familiar. 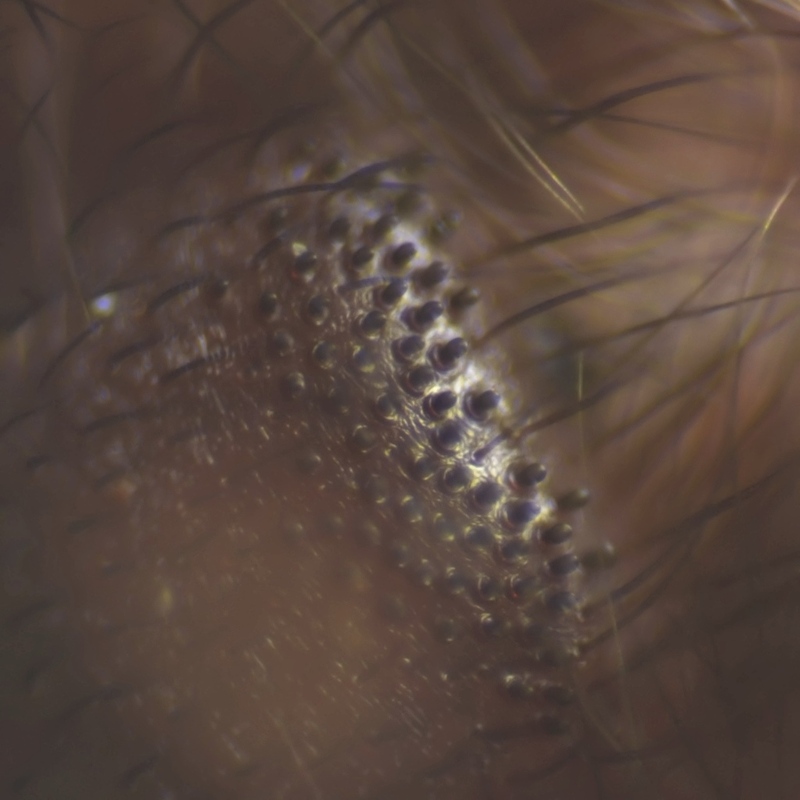 Spherical aberration (SA) manifests as reduced contrast, particularly for moderately fine detail but not so much for the very finest detail. Assuming the reasoning in my own approach to be at least loosely valid, this to my mind solves the question as to why the images look somewhat better than what the focus solve arrived at by Rik's approach would indicate. One more assumption, by both of us I believe, is that the surfaces of the acrylic are optically plane, which is almost certainly not the case, but which the images seem to indicate is not an error of significance in relation to the SA introduced by the plate. But I expected this surface error to be worse than that which the images appear to exhibit, hence my surprise at the image quality which resulted. My apologies for any mistakes in synax or terminology in the discussion, I'm only an amateur. First, many thanks for the alternate and improved analysis! I greatly appreciate crosschecks of my methods and results, especially when they show that I have overlooked something important or just plain screwed something up. In this case, I had not realized how much the results were skewed by using the paraxial focus. I will take a look at that in more detail. Probably it also explains some screwy results I was getting in another case. Does your analysis indicate how much focus shift there is between the paraxial focus and the position of least RMS P-V? Well, it's a bit more than I would have thought ... increasing the subject-objective distance by ~20 microns will do the trick (if I'm reading my numbers the right way around ). You don't by any chance have a reference to the paraxial focal length of this objective do you? That would help bring my assumptions and numbers more closely in line with reality. This investigation is proving to be quite interesting to me as well as valuable in my gradual understanding of high resolution photography -- I can easily discern the difference between 1/4 and 1/8 wave P-V visually through a scope when the air is still, but have absolutely no idea how a given (smallish) wavefront error would be manifested in the output of the camera sensor ! All I seem to encounter on diffraction vs. IQ (present company definitely excluded!) is how, at various relative apertures, the diameter of the airy disk's minima relative to a given sensor's pixel size affects that sensor's "resolution". Diffraction appears to be understood only in its relation to f/ratio while neglecting to consider the influence of whatever polychromatic wavefront errors may be typical of commercially designed and produced optics. Although granted, aperture-driven diffraction likely predominates in most instances when dealing with respectably designed lenses and their makers. From what I seem to have gathered on the subject from numerous websites, today's sensors would appear to be rather more forgiving than the eye to garden-variety wavefront errors, would that be your understanding or am I mistaken on that?